Catamaran is a type of boat (or occasionally ship) consisting of two hulls joined by a frame. Catamarans can be sail or motor-powered. The word catamaran comes from the Tamil language, in which the word kattumaram means "logs bound together". The catamaran was the invention of the paravas, a fishing community in the southern coast of Tamilnadu, India. In later times, catamarans (also known as cat boats) have been used for fishing and transport in the coastal waters of New England and New York. Around the turn of the 19th century they were adapted for racing. Today the main use of the catamaran is for day sailing and leisure cruises. Catamarans in Mauritius exist in many designs, and sizes. Today it is possible to find catamarans in range of sizes, from 14 feet (4.5m) basic catamaran to 100 feet (30.5m) racing / luxury catamaran yacht. The catamarans types include beach catamarans, open deck cruising catamarans, bridgedeck cabin cruisers, racing catamarans, Trimaran and many more. A catamaran is distinguished from other boat types by its two hulls. A catamaran has one mast, and one or two sails, depending on its size. Therefore, catamaran is not really a "rig" type, but rather a boat type. 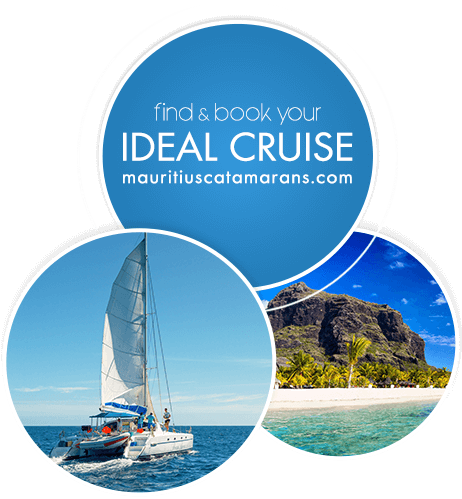 Why choose a catamaran cruise? Some of the modern designed catamarans are speedy sailboats which are ideal for open areas where maximum sailing speed is desired. Catamarans also offer the virtues of roominess, stability and simple handling. Catamarans can fly deftly across the water lifted and propelled by air packed into the sails. The modern catamarans offer all the facilities of yachts, including spacious cabins, showers, toilets, and are equipped with all the modern facilities and utilities. In Mauritius you can find catamarans in different sizes, designs and styles - from a 30 ft (9m) more basic catamarans to very luxurious 60 ft (19m) catamarans. The typical day-charter catamarans are usually at around 40 ft (13m) in size, and take between 20 - 40 persons aboard, depending on the size and its internal layout. The majority of catamarans in Mauritius offer a shaded cockpit area, with seating for each passenger and large comfortable trampolines for sunbathing and relaxing. For the convenience of passengers, in addition to toilets and onboard showers, you can enjoy the comfort of fully equipped onboard cabins during longer sailing cruises. Sailing in a catamaran means sailing in real comfort while enjoying a very relaxed sailing experience. The Harris Wilson is one of the largest catamarans available in Mauritius. The Harris Wilson is a 60ft (19m) racing catamaran which was initially built for ocean racing. This catamaran offers traveling in speed. When sailing on the Harris Wilson catamaran you can experience the thrill of a racing boat sliding on the sea. The Harris Wilson offers a more luxurious catamaran trip, with more room to walk around and a 360-degree view all around for you to enjoy. It is equipped with a bar in the middle of the deck for you to enjoy free drinks throughout the cruise.